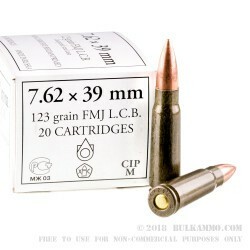 This is a great price point for rugged Russian-made 7.62x39mm ammo by Wolf. This World War II era cartridge was a staple among law enforcement agencies and military organizations all over the world for the better part of the 20th century and has since become popular among hunters and sportsman. Now you can get your own 20-round box for the range. Part of what makes this ammunition so affordable is the casing material. Each 7.62x39mm cartridge has a Berdan-primed steel casing coated with polymer to prevent corrosion. The casings are non-reloadable, but for the price, you won't feel bad about discarding them after a practice session. Wolf packs 123gr. 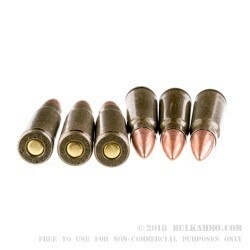 full metal jacket (FMJ) projectiles into the steel casings and these bullets are perfect for range training or plinking. Wolf designs ammunition with the high-volume shooter in mind. This 7.62x39 has the performance you crave at a price you can afford. 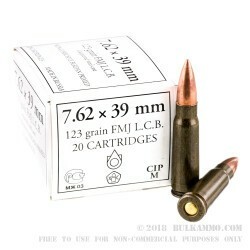 Order your 20-round box of this 7.62x39 ammo today! I got some of this ammo a while back, and it is the cleanest ammo I have ever shot. Q: Item is magnetic or Non-magnetic Ammo. A: Hello Jose, These 123gr. 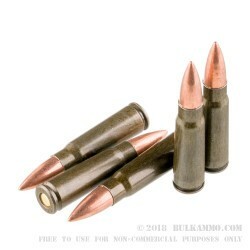 FMJ rounds by Wolf in 7.62x39 are magnetic and will attract a magnet.